Bangalore city itself is a major weekend vacation getaway. Families and corporate employees working in nearby cities such as Chennai, Coimbatore, Cochin, Mangalore, Davangere visit Bangalore during the weekend and other public holidays. The pleasant climate f Bangalore is a big attraction. Added to that are the gardens in Bangalore, its hundreds of pubs, a zoological park and camping grounds; they beckon people from neighboring states. If that is so, where do Bangaloreans go during weekends? Do they go to the same places from where others visit Bangalore or are there more beautiful places near Bangalore that are excellent weekend holiday places? Let us look into some of the ideal weekend getaways near Bangalore that do not exceed 6 hours of drive. Nandi Hills located just on the outskirts of Bangalore is the most visited weekend vacation getaway for the residents of Bangalore. The distance between the center of Bangalore city and the Nandi Hills is just 60 km. The top of the Nandi Hills stands at 4800 feet! There is a fort built by Tippu Sultan. He is said to have thrown out the prisoners from a particular point called “Tippu’s Drop”. 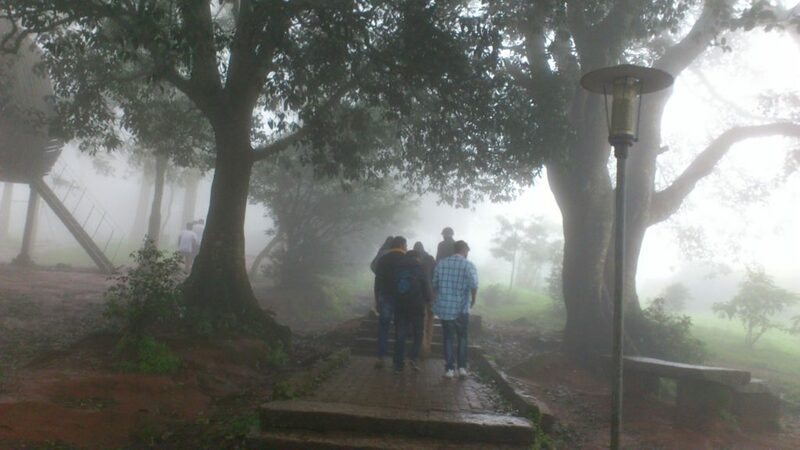 The weather is very pleasant in Nandi Hills. There are a handful of places to stay there. Food is also served by the hotels but the taste is horrible. Since there is no other option (all the restaurants serve the same kind of food), you have to endure either the food or your hunger. The air is fresh and cool. Walk to your heart’s (legs’ ?) content on a neatly laid out paved path or explore the hill on your won by climbing the steep meadows. The scene is breathtaking. If you are an avid bird watcher, you will have a very good time spotting the colorful birds of Nandi Hills. Coorg is the second most preferred weekend getaway near Bangalore though the distance is more than 200 km and the driving takes more a little more than 6 hours. The Coorg is a hill station with inexplicable natural beauty. Tea gardens, lush forests, hidden waterfalls, coffee estates, and cardamom plantations are the major sightseeing attractions in Coorg. Coorg’s accommodation is certainly expensive. I would say there are no budget hotels at all. The food is predominantly Kannada cuisine, though, there is no dearth of North Indian and Malabar cuisine. The distance is 275 km from Banglore. Strolling on the verdant green meadows is an exhilarating experience in Goorg. Adventure enthusiasts indulge in riding ATV’s (all-terrain vehicles) and paintball sessions. Of course, Coorg is a paradise for bird watchers. They can find even migratory birds in Goorg. This weekend getaway near Bangalore is located just 50 km away from the City. This is a very cheap weekend vacation getaway near Bangalore. This quaint hillside became very famous when the popular Hindi classic ‘Sholay’ was shot in the rocky surroundings of Ramanagara. Mountaineering is passionately pursued here because of rocky terrain that is not covered with any vegetation. Surprisingly, there are several hotels and resorts in Ramanagara catering to different budgets. Some tour organizers and adventure clubs based in Bangalore and Mysore offer camp stays at picturesque locales in Ramanagara. Since the distance from Bangalore is just 100 km, Bheemeshwari is a sought after a weekend trip by the Bangaloreans. River Cauvery is the main attraction in Bheemeshwari. During peak monsoon, the river gushes in with terrific force and daredevil adventurers indulge in river rafting during that time. Are you a lover of dense jungles of India? If so, Bheemeshwari is the right choice for you to let yourself loose and go wild in the adjoining forests of Bheemeshwari, Such a wonderful weekend getaway near Bangalore should not be missed. Apart from white water rafting, you can test your courage by taking part in kayaking on the river Cauvery or enjoy a short stint of ziplining (sliding across a metal wire connecting tow points in a mountain). Several hiking trails welcome avid walkers throughout the year. Oh, yes, I forgot about the coracle rides in Bheemeshwari. Coracles are nothing but a round shape boat like structure built with bamboo poles. No, it is a not a barge but more of a curved boat where you have to sit cross-legged. It is paddle driven by the coracle owner. It is a thrilling experience. Coracle rides are not seen anywhere in the world except a few places in India, that too in South India. Apart from mid-range hotels to stay, you can try staying close to nature by sleeping inside tents and jungle lodges. That will be a lifetime experience. Bheemeshwari is a perfect weekend getaway near Bangalore. This weekend getaway is popular among adventurous youth only as the place is known for its cave exploration. It is located about 70 km from Bangalore. 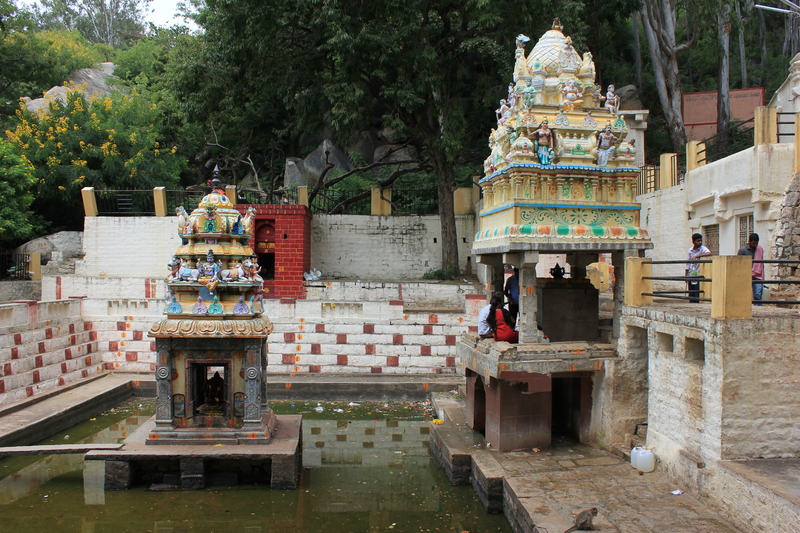 Kolar should be your destination if you want to go to Antara Gange from Bangalore by bus. From the gold mine city of Kolar, your weekend getaway is just 2 km. Apart from the caves, you would be captivated by the Shathashrunga mountain range. This temple dedicated to Kasi Vishvanath is the also major attraction for the local villagers. A perennial weekend getaway destination for the residents of Bangalore, though the water in the Hogenakkal Falls would be at its thunderous best only during the rainy season. The sacred river Cavery enters the State of Tamilnadu at Hogenakkal near the town of Dharmapuri. Weekends are pretty crowded in Hogenakkal. Though there is an abundance of accommodation in Hogenakkal, advance reservation is required. For eating, you will have a tough time in choosing the restaurants because of their numbers. Don’t forget to taste the freshly caught fish fry that is cooked in front of your eyes. They are very spicy and filling too. Hogenakkal weekend getaway is located 180 km from Bangalore. A nearby attraction is the Mettur Dam built on Cavery River for the irrigation purposes in Tamilnadu. 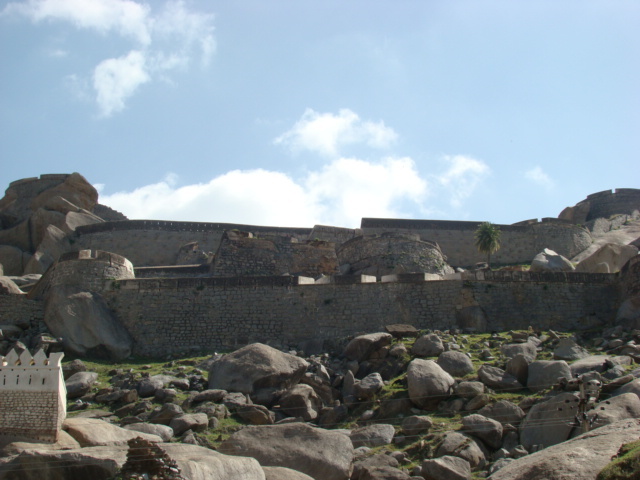 If you drive in a car, you will reach Madhugiri in about 90 minutes covering a distance of 100 km from Bangalore. 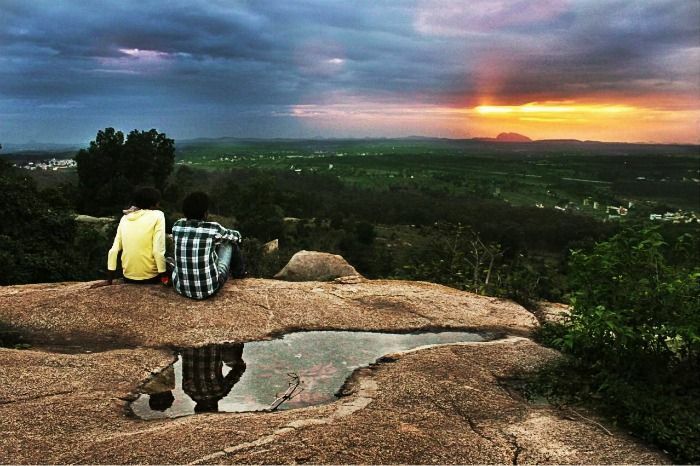 Again, this weekend getaway near Bangalore attracts only adventurous youth as trekking is the only action in Madhugiri. 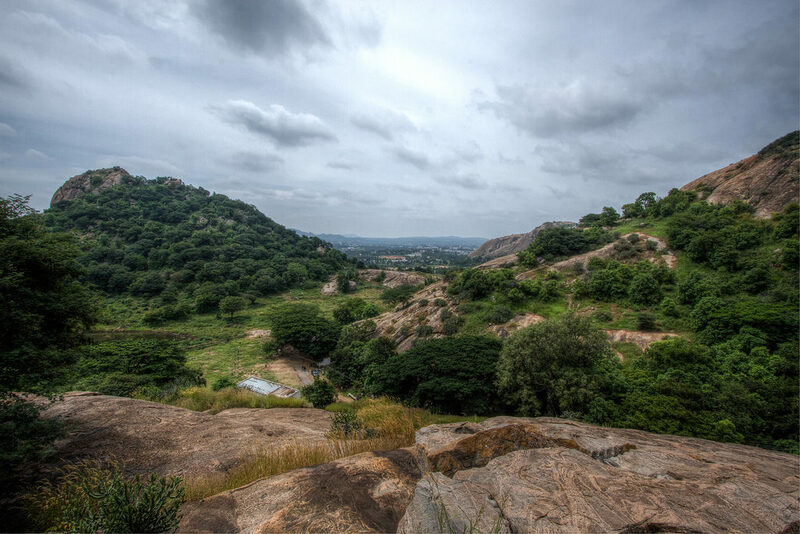 Madhugiri is a popular trekking destination located near Bangalore. There is a monolith that is ranked as the second largest in Asia. The place attracts adventure enthusiast including both novices and veterans. It is a perfect weekend getaway for the adventurous Bangaloreans. There is a fort atop the rocky mountain. Jayamangali Blackbuck Reserve-located 25 km from Madhugiri foothill. Siddara Betta-a place for natural springs and herbs. Timmalapura Forest-spot peafowls and sloth bears. I would say kanakapura is the best weekend getaway near Banglore because of the lush Turahalli Forest, home to several wild animals including the daring panther that is often seen entering the houses of nearby residences. The distance to Kanakapura’s green surroundings is only 50 km from the heart of Bangalore. Trekking, especially night trekking is the most pursued adventure activity in and around Kanakapura. Trekkers’ Clubs in Bangalore frequently organize outings to Kanakapura and even arrange tents to stay overnight just to feel and smell the nature at its unpolluted best. I believe there are a lot of luxurious resorts and simple cottages too in the vicinity of Kanakapura forests. Young visitors take part in an adventure called ‘abseiling’ that is also known as ‘rapelling’. It is a way of climbing down a rocky mountain with the help of strings and hooks. Kanakapura as a weekend getaway witnesses year-round activity. 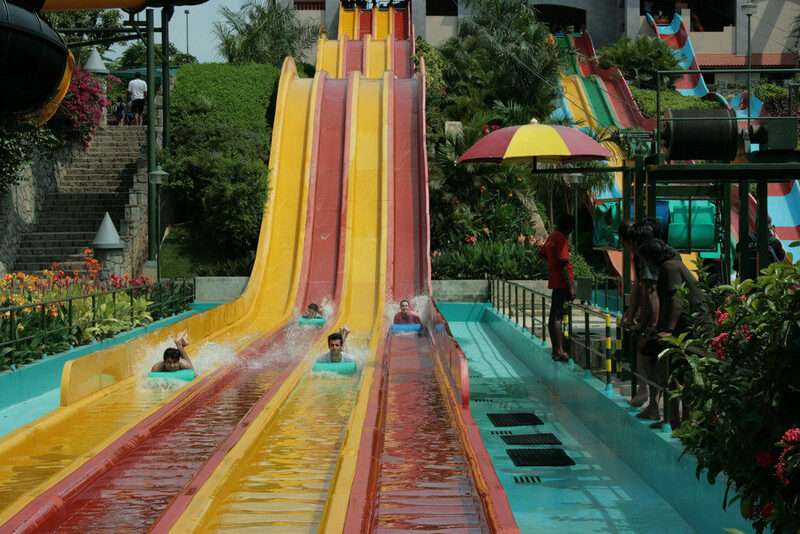 What better way to spend your weekend with kids than taking them to Wonderla, Asia’s 7th best amusement park. You and the children can enjoy several rides and water-themed activities and can also stay during the weekend in the attached luxury resort. The distance to Wonderla amusement park is only 30 km Bangalore. If you want your children to have a great weekend and also get pampered by the resort staff, then, Wonderla amusement park and resort in Bidadi near Bangalore is the perfect weekend getaway. If you travel 60 km north of Bangalore towards Doddaballapur, you will reach the scenic weekend getaway called Makalidurga. There is a fort at top of a hillock and a Shiva temple too that is worshipped ardently by the nearby peasants. Nature is untouched that can be seen and felt only by trekking through trails that are hitherto untrodden. The legendary sage Markandeya did penance here. A weekend getaway doesn’t mean staying overnight at the place of your visit. Even if you spend a full Saturday or Sunday and return on the same day is also considered as a weekend getaway. 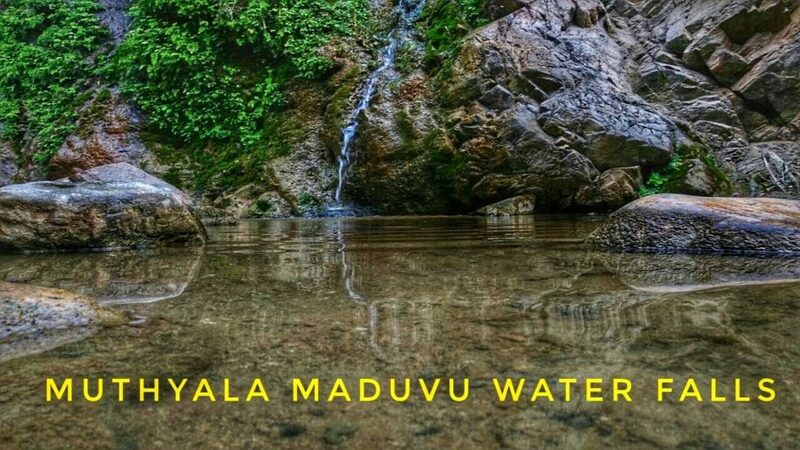 In that sense, your visit to the Muthyala Maduvu Waterfall that is located less than 30 km from Bangalore’s Silk Board can act your short weekend getaway. The Muthyala Maduvu Waterfall is seen close to the famous Bannerghatta National Park. This place is somehow hot throughout the year. Nature’s antidote to cool yourselves is taking a plunge in the small lagoon at the foot of the waterfalls and spend some time just splashing around in the pool. Look at the gushing water sliding through granite rock that is made smooth by the repeated onslaught of water! Isn’t it beautiful and make your weekend getaway from Bangalore worth the pains? 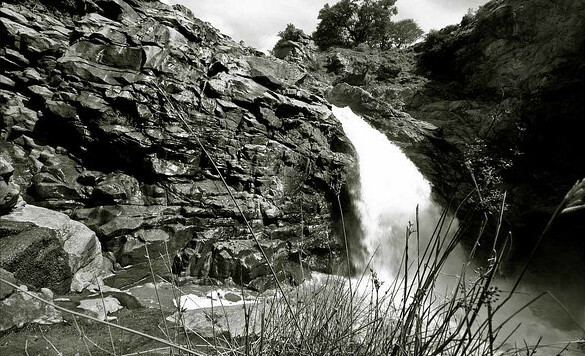 This beautiful waterfalls near Bangalore is located approximately 100 km away. The water falls from a good height of 50 feet and is fed by Arkavathi River. For those who like to spend their weekend without much noise and pollution, the Chunchi Waterfalls is an ideal weekend getaway. 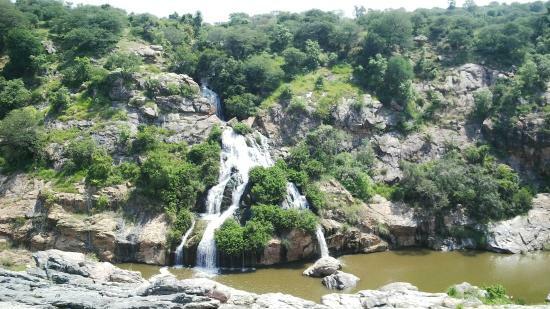 If you have a liking to visit the Turahalli Forests of Kanakapura, you can combine that visit with Chunchi Falls trip.